Swimming pool fill in service has become quite popular in Toronto. The high maintenance cost and other expenses that are involved with having a swimming pool makes it a liability than a platform to have fun and adventure. A swimming pool fill in service is the best way to get rid of the swimming pool and the high cost that comes along with it. With a plenty of pool fill in services available in Toronto, it is extremely important for people to find the best company who has both, the experience and the expertise to carry out the job of filling in the swimming pool. There is a certain procedure to fill in a swimming pool, which only professional people know. This is perhaps the reason that one should take the help of a professional swimming pool removal and the pool fill in company. Let us take a look at the pool filling-in procedure that most companies prefer these days. In this, the pool liner and the steps will be removed. Next, the holes will be punched through hammering the shallow and the deep ends of the bottom of the swimming pool. The final step is to entirely remove the steel. In these swimming pools, he sides are broken down to one and a half to two feet below the ground level. In the next step, all the undesired concrete decks are broken up and kept aside. How does a professional pool fill-in company handle the materials? A professional company makes use of pylons and signage to let people know that there is work going on and there are heavy machinery involved in the process, so they are requested to drive safely, especially at the time when the company dumps all the unnecessary pool materials in the street. Once the process is complete, the company starts off with the maintenance and the clean ups. They sweep the entire work area in an efficient manner, so that the property of the customers and their neighbors remain same as before. As it is very important to pour soil onto the empty space that was created after removing the swimming pool, so a professional company is going to buy the best quality topsoil. They are going to make sure that the topsoil is contaminant free. It is pivotal to fill in at least six inches of the topsoil after compacting. This is the minimum that has to be done. They can add more if required. Besides pool fill-in service, it is quite important for people to get backyard grading. This grading is done to assure that the drainage is proper in the area from where the swimming pool has been removed. There has been occasions where most of the time has been spent in the backyard just to make sure that it is plain and smooth. A professional pool fill-in service in Toronto is going to do all the damage control work such as, laying down plywood on the yard in order to avoid any annoying disruptions to the lawn. They are going to replace the gates that they have removed in order to get an access to the swimming pool. They don’t want their clients to carry out these time consuming jobs on their own. Once the swimming pool fill-in process is complete, the company is going to clean up the area thoroughly. The cleaning process will start off with the removal of the installed plywood. Moreover, they are going to wash the walkways and driveways because that’s how professional companies work. Also, if there is any damaged grass, then that will also be replaced with the new one. 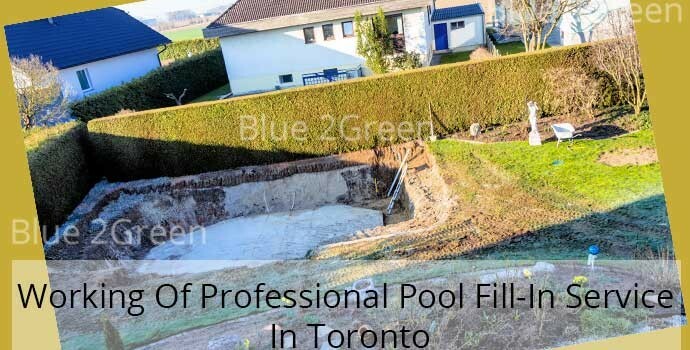 Now, the only job left for the people is to look for the best pool fill-in service in Toronto. There are many available in the city, but only a few are capable of handling the jobs in the most appropriate manner.